One of my goals in writing this blog has always been to educate anyone I can reach with my words on how to cook delicious food in their own kitchens, food that is as good or better than what can be found in restaurants. I personally believe that cooking whole, fresh foods in our kitchens can help reverse the epidemics of obesity, type 2 diabetes, and heart disease that has begun to run rampant in American culture. And, I believe that cooking and eating at home can be less expensive than eating fast food, while delivering better nutrition, and thus can help boost food security in these times of economic hardship. Food security is an issue that is close to my heart; I grew up in West Virginia and when my Dad was laid off of his job at Union Carbide for a year, and our savings account was drained, I remember not having much to eat. That is, until my Mom’s parents–my Grandma and Grandpa who had a farm–came to visit. Seeing a nearly bare cupboard, they brought us bags and bags of home-canned fruits and vegetables, and boxes of frozen pork, chicken and beef, as well as dozens of freshly laid eggs. I will never forget how good that food tasted after eating very little but beans and cornbread for weeks. And I have always been generous and shared food with my less fortunate neighbors since then. That’s why I work with a local non-profit organization called Community Food Initiatives here in Athens. CFI works to boost local food security in Athens and the surrounding areas by collecting donations of food and money at the Athens Farmer’s Market. The money collected there is then spent there among the vendors, and all of the food is then donated to local agencies such as food pantries, soup kitchens, homeless and domestic violence shelters, so that those who don’t have enough money for food have fresh, local, nutrient dense produce to eat. The CFI also teaches classes in how to can, how to grow gardens, how to compost and how to grow fruit trees. I may end up teaching a series of classes on basic vegetable and fruit cookery; one of the issues that has consistently come up for the CFI is that community members often don’t know what to do with some of our most often donated vegetables such as greens, eggplant and summer or winter squash. Which is how we come to the subject of this post. On Thursday, while volunteering at the CFI Donation Station where we inventory the food that came in and divide it up to be picked up by folks from the various agencies we serve, it turned out that there was a surplus of eggplants, summer squashes of all sorts, tomatoes, onions and basil. I decided to take some home and make a big batch of ratatouille to be given to The Athens Community Church which hosts a weekly free dinner on Friday night. It turns out that one of my neighbors is involved with the small food pantry that the church maintains, as well as being one of the cooks for the dinner, so I figured I could make the food and then take it straight to her house to donate it to the church. So, about oh, I guess ten pounds or so of the aforementioned vegetables and herbs came home with me and I ended up spending a happy hour sauteing, slicing, peeling and mincing while a huge pot of increasingly headily scented stew bubbled on the stove. Which, of course, is what ratatouille is–a vegetarian stew popular in Provence, France. Technically, basil isn’t used in the stew–parsley is, but I have to admit to always using basil in mine. I figure I’m not in France, so who cares, right? And, usually only zucchini is used in the stew, but well, I put yellow crookneck, zucchini, pattypan and some sort of baseball-sized round summer squashes in it, because that is what I was given. And, usually, the eggplants used are the big fat European kind, but all we had left over was the long, thin, white or lavender Japanese varieties and the small, striped Indian ones. Which is fine with me–I honestly like the flavor and texture of the smaller eggplants better than the large ones anyway–they are less bitter and have fewer seeds while retaining the unctuous, smooth consistency in the flesh just like their larger deep purple cousins. After adding a head of garlic and some cooking oil from my larder the donated vegetables and herbs were quickly turned into two and a half gallons of fragrant, sweet, heady stew which for all that it tastes rich, is low in fat and calories, but high in fibre and vitamins. When my neighbor brought my storage container back after the dinner today, she was smiling. 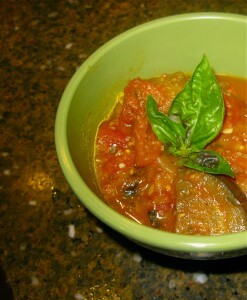 The ratatouille was a hit, so I’ll be sending along the recipe with her to give out among the diners. It even turned out that a vegetarian had shown up for the dinner and they were happy to have something so good for her to eat. Heat the olive oil in the bottom of a large, heavy pot. Enameled cast iron is awesome for this, but a plain old stainless steel copper-bottomed soup pot works just as well. Add the onion slices and sprinkle with salt and cook, stirring, until the onions turn pale yellow. Add the pepper, stir and cook until the onion is a nice deep gold and the pepper bits have started to brown slightly. Add the garlic, and cook until all is fragrant and the onions start to stick a bit to the pot. Deglaze the pot with the wine and allow the alcohol to boil away. Add the eggplant and squash and cook, stirring until the vegetables are soft and the squash have started to brown slightly. Add the tomatoes and their juice, and turn down the heat to simmer until the stew has thickened and is somewhat like a jam in consistency. Stir in the basil and either serve immediately, hot, or you can cool it down, refrigerate it overnight and serve it cold. In either case, it is wonderfully delicious. Ratatouille can also be used as a pasta sauce, and though it is terribly untraditional to do so, I have to say that spaghetti twirled with this stew is mighty tasty. Definitely worth breaking rules to eat! I love recipes with stories. An such a lesson on possibilities when we see abundance. So much waste goes on when dishes like this should be made! I always laugh at the name. When the Disney movie hit, my nieces and nephews were so excited to visit when wacky uncle Dave was gonna make ratatouille for them. While their enthusiasm waned a bit as they saw nothing but vegetables, they indeed lapped it up with the sweet marinara sauce we steeped all day. Talk about good press for a dish!